Shawnee State’s baseball team swept Lindsey Wilson over the weekend, the program’s first conference sweep in five years. Portsmouth, Ohio – The Bears sweep! 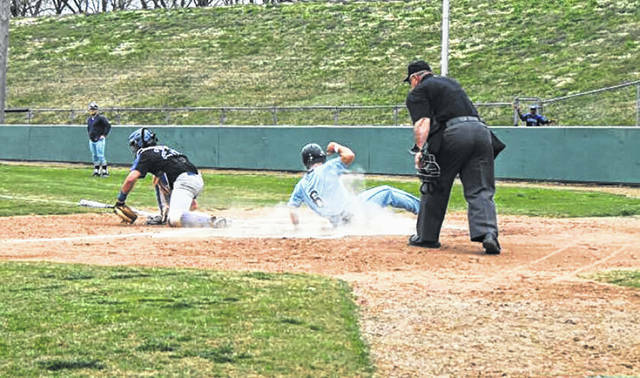 Shawnee State Baseball would get their first sweep in conference play in five years this weekend defeating the Blue Raiders of Lindsey Wilson in three games. After a five run first inning for the Blue Raiders, Ryan Lambert (FR/Greenup, Kentucky), who would get the start in game one for the Bears settled in and went onto give the Bears six innings. Lambert had an excellent outing, allowing six runs on eight hits with two strikeouts as well. Marty Knittel (FR/Niles Township, Ohio) would be first out of the pen for the Bears as he would provide them with one solid inning allowing no runs on one hit to complete his outing. Dalton Phillips (SR/Hastings, Michigan) would then be put in to close the game out for the Bears, Phillips would only allow one run on three hits with one strikeout. The Bears bats in game one would be very consistent as they would score every inning for the first five innings. However, they would get quiet after the bottom half of the fifth inning and would not score another run. George Duran (FR/Orlando, Florida) would be the first to get the Bears on the board with a double to right field scoring Phillips who had reached base earlier on a fielder’s choice. Later in the inning, Chase Thurber (SR/Andover, Ohio) would score on an infield error. The following inning Christian Helton (SR/Lexington, Kentucky) would keep the momentum rolling as he would single to left field only to be driven in by Phillips on a single to center field. Danny McGuire (SO/Cleveland, Ohio) and Blake Marshall (SR/Lexington, Kentucky) would get the Bears going in the bottom half of the third inning as well with a pair of singles. Alex Medina (SR/Miami, Florida) would then come up to drive in McGuire and advance Marshall to second base bringing up Helton. Helton doubled to left center field to bring home Marshall. The Bears two runs in the bottom half of the fourth inning would come from a two-run home run hit by Howie Rodriguez (FR/Orlando, Florida) as he would also knock in McGuire who reached base on a base hit the previous at bat. Phillips would bring home Helton who reached base earlier in the inning on a fielder’s choice. That would prove to be all the run support the Bears would need as they would go onto defeat the Blue Raiders Friday afternoon. Ben Sellers (JR/Evansville, Indiana) would get the start in game two of the three game series on Saturday. Sellers would give the Bears a solid start going five innings only allowing two runs on three hits with two strikeouts . Marty Knittel would be first in relief and would complete the game for the Bears. Knittel would go two innings allowing no runs on one hit with three strikeouts to complete his outing as the Bears would go onto run rule the Blue Raiders in game two. The Bears offense was electric in game two Saturday afternoon as they would go onto put up thirteen runs against the Blue Raiders. The offensive charge would be led by Danny McGuire who would go three for three with a double, a walk, a run scored, and two RBI’s. Dalton Phillips, Sellers, and George Duran would also help carry the offensive load with multi hit games. Dalton Phillips would be called upon to be the game three starter for the Bears Saturday afternoon in the final game of the series. Phillips would give the Bears a five inning start allowing three runs on eight hits with five strikeouts on the day. Seth Wills (JR/Gallipolis, Ohio) would be put into the game in the top half of the sixth inning and would give the Bears one and one thirds innings in relief only allowing one run on one hit with three walks and one strikeout to complete his outing. Drew Lowe (SO/Sciotoville, Ohio) be inserted into the game to relieve Wills and would provide the Bears with two thirds of an inning as he would come in and do his job allowing no runs on one hit with one strikeout as well. The Bears offensive production in game three would not come until late in the game as they would score all five of their runs in the sixth and seventh innings. The Bears would tie the game at three in the Bottom half of the sixth inning. Dalton Phillips would get the inning started with a lead off double to left field. Chase Thurber would single up the middle the next at bat to bring home Phillips for the Bears first run of the game. Collier Wireman (FR/Greenup, Kentucky) who would be put in the game for Thurber would score on a wild pitch for the Bears second run of the game. Alex Medina would then tie the game by reaching on a fielder’s choice and scoring George Duran who reached base on a hit by pitch earlier in the inning. Ben Sellers would be hit by a pitch and Phillips would reach on a walk to start the bottom half of the seventh inning. Wireman would then lay down a sacrifice bunt to advance Sellers and Phillips. George Duran would then come up to hit a walk off double to deep right field to bring home the win and to complete the three-game sweep for the Bears. Drew Lowe would get his first collegiate win on the mound in game three. George Duran (3), Ben Sellers (2), Dalton Phillips (2), Danny McGuire (2), Christian Helton, and Alex Medina all had multi-hit games for the Bears.